This iExpression allows to align layers relative to the composition, i.e. they can be placed centered or at the borders of the composition. This placement is dynamic, i.e. if you change the composition size the placement adjusts automatically. aligns the layer horizontally. If 'none' is choosen, the keyframed x-value remains unchanged. aligns the layer vertically. If 'none' is choosen, the keyframed y-value remains unchanged. allows to move the layer away from its aligned position. This is useful, for example, if you want to place the layer at the border of the composition but keep a certain distance to the border. determines which point of the layer is aligned relatively to the composition. 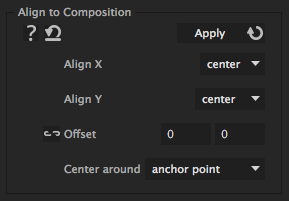 When 'anchor point' is choosen the position of the layer is changed such that the anchor point is placed where specified (i.e. centered or at the border of the composition). If you choose 'layer boundaries', the boundaries of the layer are aligned to the boundaries of the composition, i.e. when aligning at the top, the top border of the layer is placed at the top border of the composition. The option 'layer boundaries' is only working for footage-based layers and not for other layers like text layers, as for those expression cannot determine the boundaries.